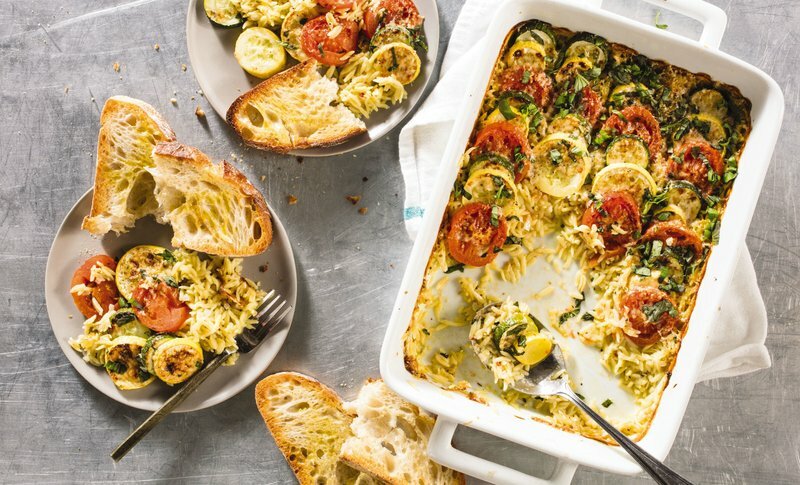 This colorful vegetable casserole has a striking look but a simple approach. A tian is an assortment of roasted vegetables cooking in a shallow dish, sometimes with cheese or au gratin. 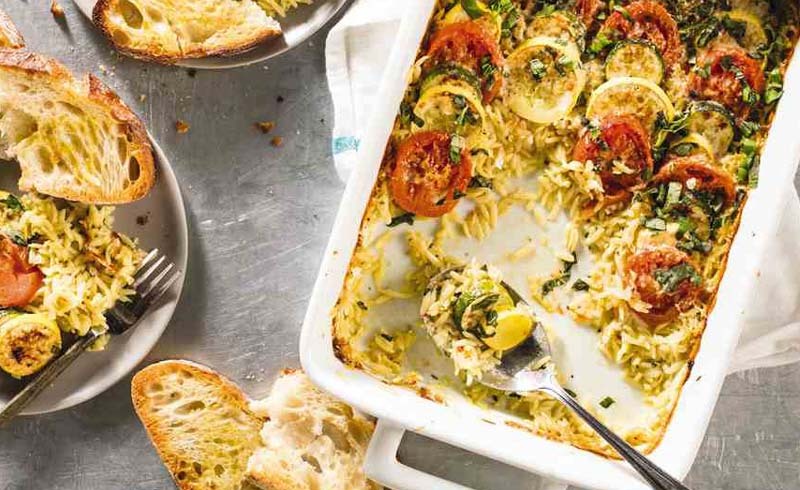 Arranging slices of moisture-rich zucchini, summer squash, and tomatoes over the uncooked orzo and baking the dish all together lets us skip precooking the pasta and streamlines the recipe. Garlic, shallots, oregano, and pepper flakes add punch to the fresh vegetables, while a topping of broiled Parmesan adds just the right finishing note. Crisp garlic toasts are a perfect accompaniment to the creamy orzo. Look for squash, zucchini and tomatoes with similar-size circumferences so that they are easy to shingle into the dish. Adjust one oven rack to middle position and a second rack 6 inches from broiler element and heat oven to 425 F. Grate Parmesan (1 1/2 cups). Mince shallots. Mince 3 garlic cloves. Combine orzo, oregano, pepper flakes, 1/2 cup grated Parmesan, shallots, minced garlic, and 1/4 teaspoon salt in bowl. Spread mixture evenly into broiler-safe 13-by-9-inch baking dish. Carefully pour broth over top of vegetables. Bake on lower rack until orzo is just tender and most of broth is absorbed, about 20 minutes. Meanwhile, slice four 3/4-inch-thick slices of bread and spread out evenly over rimmed baking sheet; set aside. Remove dish from oven and heat broiler. Drizzle vegetables with 1 tablespoon oil, and sprinkle with remaining 1 cup Parmesan. Broil on lower rack until nicely browned and bubbling around edges, about 5 minutes. Remove dish from oven and let rest for 10 minutes. While tian rests, broil bread on upper rack, flipping as needed, until well toasted on both sides, about 4 minutes. Peel remaining 1 garlic clove and rub one side of each toast with garlic, then drizzle toasts with remaining 1 tablespoon oil and season with salt and pepper to taste. Chop 2 tablespoons basil and sprinkle over tian. Serve with toasts. Nutrition information per serving: 506 calories; 134 calories from fat; 15 g fat (5 g saturated; 0 g trans fats); 20 mg cholesterol; 875 mg sodium; 75 g carbohydrate; 7 g fiber; 11 g sugar; 19 g protein.